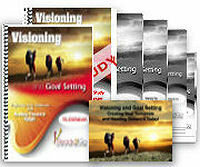 Teleseminar & Self-Study Coaching Program: Visioning and Goal Setting - Projecting Your Tomorrow and Heading Toward It Today from Ready2Go Marketing Solutions, Inc. When your life comes to an end, what will you have accomplished? What will be the results of all your daily, weekly, and yearly efforts? And what about today? Do you see the remainder of your life as limitless in its potential? Do you feel you have great, untapped promise? Sadly, most people feel they are capable of a life far more enriching than the one they are currently living. So what’s missing? And what steers us away from what we want and makes us accomplish far less than we had hoped? Extensive research done at several prestigious universities points to the same conclusion: every person who accomplishes a great deal, and performs at optimum levels, does so by having a clear vision and goal of what they want. 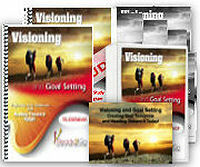 Having a clear vision and goal is the hallmark of every form of high achieving. To achieve anything, you first have to see what you want. To do so you must create your own personal vision. In this program, participants will explore what visioning is and why it’s so important. They will also look at how having a vision – a mental picture of what they desire – is an important key to success in life. And finally, they will do some discovery around goal setting, and discover how goals can get them from where they are to where they want to be in their lives. Activity Objective: Participants determine how they would spend free money they are given. Activity Objective: Participants choose a question that interests them and capture the answer it generates. 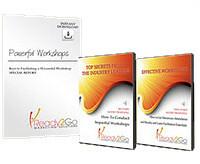 Activity Objective: Participants engage their imaginations through a creative visualization. Activity: "Partially Completed Pictogram - Part 1"
Activity Objective: Participants complete a pictogram with information that is supplied during a presentation. Activity Objective: Participants explore the concept of having purpose, focus and direction in order to move forward in their lives. Activity: "Partially Completed Pictogram - Part 2"
Activity: "Visioning and Goal Setting Worksheet"
Activity Objective: Participants review a tool that can help them to create their own vision and set their own goals going forward. Activity: "If One Word Could Say It All"
Activity Objective: Participants summarize their learning in one word.